One of the joys of a hot, summer evening for me is the opportunity to have a swim after the sun goes down, before hopping into bed. I always make sure that there are no outside lights shining from the house and, because we live in the countryside where there is virtually no light pollution, on a clear night it’s a great place for star-gazing. The most awe-inspiring sight has to be the Milky Way, the luminescent band of light made up entirely of stars, clearly visible in the Andalucían night sky. There are other cosmic masterpieces to be seen at certain times of the year when our planet Earth passes through bands of dust and debris that circle the Sun. We see these as meteor showers, and a perfect example is the Perseids (a prolific meteor shower associated with the comet Swift-Tuttle), which occurs around the 12th August each year. Once again, I will be floating in the pool, watching these tiny fragments of space dust hurtling into our atmosphere at enormous speed, before burning up, to provide magnificent celestial fireworks. Much slower are our own Earth-launched satellites which drift lazily by. There are so many satellites circling the planet these days, that you can usually spot one within a few minutes. Their speed is deceptive though, because the satellites are very high, they actually have to maintain about 18,000 miles per hour to remain in orbit. 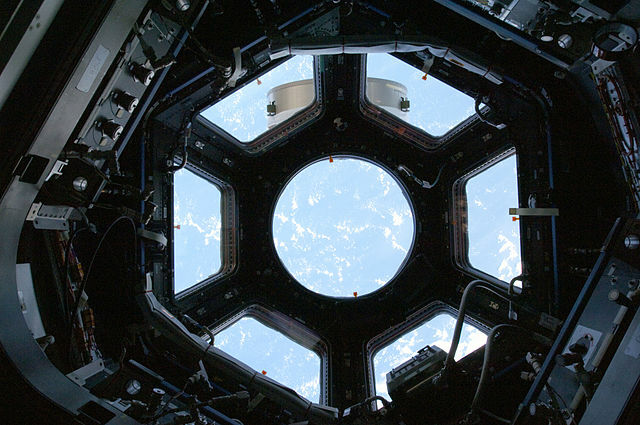 But the object I’m always fascinated to see tracking overhead is the International Space Station – a man-made habitable satellite which serves as a microgravity research laboratory. Flying at 27500 kilometres per hour (that’s an average speed of 7.65 kilometres per second), the ISS maintains its orbit at an altitude of between 330 km and 435 km. With an approximate size of 110 x 70 x 20 metres, the International Space Station (ISS) reflects plenty of sunlight and is usually the second brightest object in the night sky (after the moon), so is easily visible with the naked eye. 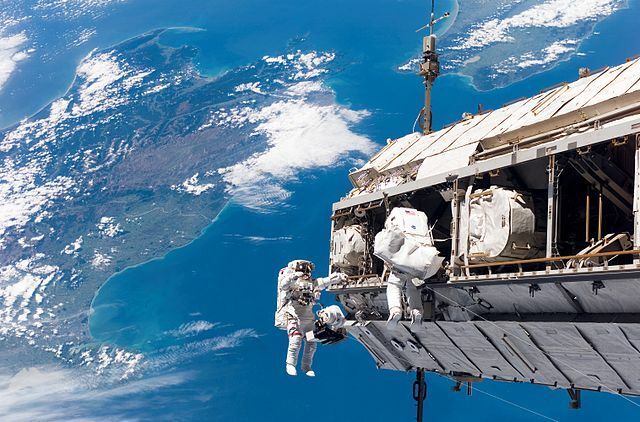 Just look at the amazing view from the ISS! 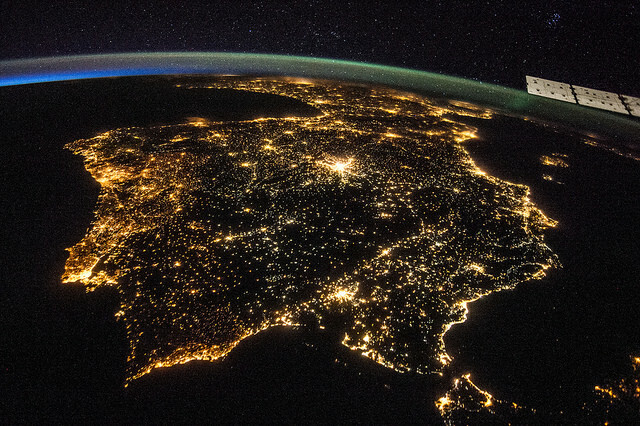 One of the six crew members aboard the International Space Station recorded the above amazing photograph of the entire Iberian Peninsula (Spain and Portugal) on July 26, 2014. Part of France can be seen at the top of the image and the Strait of Gibraltar is visible at bottom, with a very small portion of Morocco visible near the lower right corner. I’d LOVE to take photos through this window! 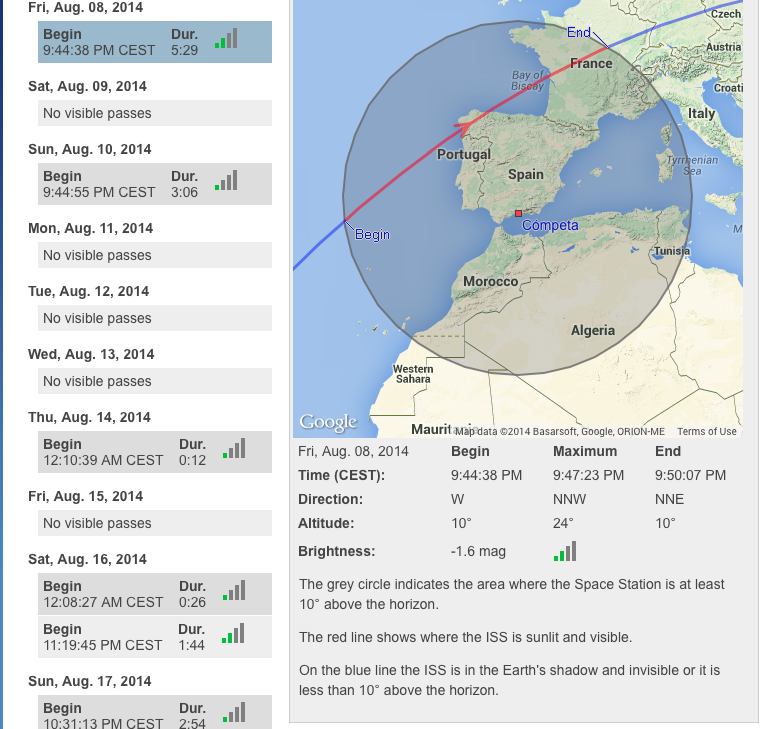 How can you get a good view of the International Space Station as it passes overhead? Well, the first thing you should do is try to get away from the light pollution of a town or city, on a clear night. If there is cloud cover you are unlikely to see anything. The ISS looks like an incredibly bright, fast-moving star which can easily be mistaken for an aircraft. What distinguishes it from an aircraft is that it has no flashing lights. 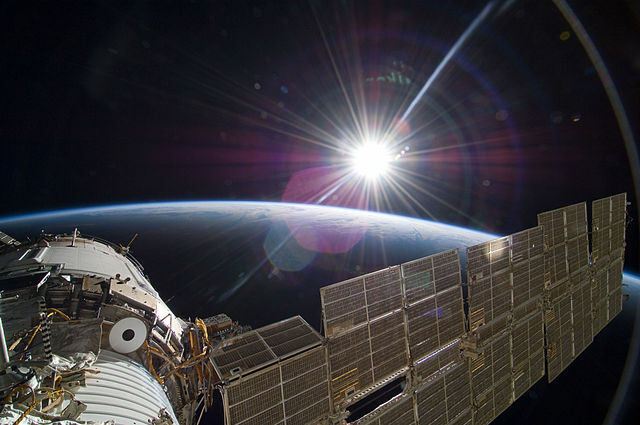 The light we see from the ISS is reflected sunlight, meaning that the best time to observe the craft is in the evening, not long after sunset or in the early morning, before sunrise. The next thing you should know is that the ISS always passes overhead starting from a westerly part of the sky, but not always from the same point. It can be low on the horizon for some passes and very high for others. 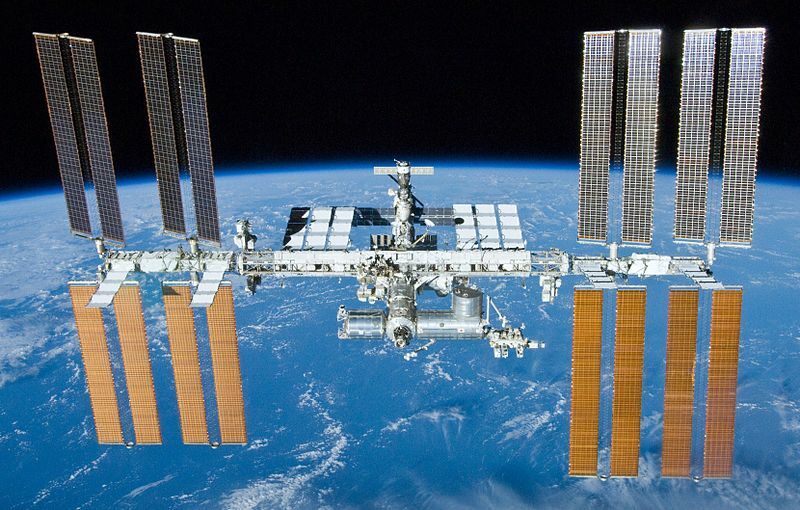 When can you observe the International Space Station from where you are? To see the current position of the International Space Station click HERE. Once you click through to that page, not only can you see what the astronauts can see, you can also view the ground track of the next orbit of the ISS. Next, you need to click HERE and at the top right of the upcoming page you will see a box that says “Your location” and underneath that the default location is shown as New York City. Type YOUR location in the box, hit SEARCH and you’ll get something like the image below. (This is the image I found last night when I did the same thing – that’s why it shows Spain). So now you can see a list of the next sighting opportunities for YOUR location (on the left of the page), with the green bars indicating the brightness of the ISS on its pass. The list contains all visible passes of the ISS during the next ten days. If you select a particular pass, you can get more information about it. In the photo above, you can see that for my location in Cómpeta, Spain there was an ISS pass last night (Friday August 8th) at 9.44pm lasting 5 minutes and 29 seconds with 2 green bars for brightness. My next best chance to view the ISS is next Saturday night (16th August) at 11.19pm. Let me know if you’ve ever seen the ISS. Do you watch for it regularly? I know I do! This entry was tagged Andalucía, Cómpeta, East of Malaga, Europe, life, Malaga, photography, Space, Spain, travel. Bookmark the permalink. How fascinating Marianne!! I had no idea the space station was visible to the naked eye! Yes indeed! Will you be looking for it, Madhu? Thanks for the detailed explanation and photos Marianne. Date/time set in my diary to hopefully see it next Saturday (despite the Cataracts). It’s all year round, Trish …. it just happens to be summer here at the moment! Great Marianne, thanks for the links! Well, this was the most interesting blog post I’ve read in a while! My husband and I were both fascinated, and looked up the page to find the time for our best viewing. It’s at 5.39 on Tuesday morning. It’ll probably be minus something degrees. But we have little light pollution here so it’ll be worth it. I’ll let you know if I do it! How kind of you to say that, Trish. I love watching the night skies because there is always so much to see. We had some visitors recently and, after dark, I suggested that we go outside to look at the stars and try to spot a satellite. The woman (who was in her 60s) said she had NEVER seen a satellite. Never! I was determined to find one for her and sure enough, within a few minutes we had one. This same woman had never seen the Milky Way either – she said she had noticed the stars, but had never really looked hard enough to see the milky whiteness behind them. She was absolutely amazed! I hope you manage to spot the ISS with your hubby. Don’t forget that if you don’t see them in a day or two, they will be around again soon. The sightings seem to come in groups …. sometimes you don’t see them for a couple of weeks and then they pop up again. Thanks for sharing the site and the beautiful pictures. The ISS reminds me of what amazing things we are capable of! The photos are amazing, aren’t they, Linda? Only wish I had taken them! Great post! What an amazing achievement! ps but have seen the ISS from here, and from New Zealand.. wonderful to see. When we first moved into our house near Alcaucin 11 years ago we used to really enjoy star gazing as there was no light pollution, but unfortunately since then we have neighbours who light their house up like Blackpool illuminations which has put a stop to this….so sad. OOHHH that’s a shame, Sandra. Still, I guess you can still walk nearby to see the stars? Great post and pictures. I became fascinated by the ISS when the Canadian Commander Hadfield was on board earlier this year. He was very active on Twitter, often posting pictures of of Earth he’d taken from the station. He also did an amazing version of Bowie’s Space Oddity whilst in space! For sightings of the ISS and much more in the UK @VirtualAstro on Twitter gives regular information and pictures. Yes, I followed him on Twitter. Great guy and improved interest in the project a thousand-fold! Thanks for the tip about @VirtualAstro.